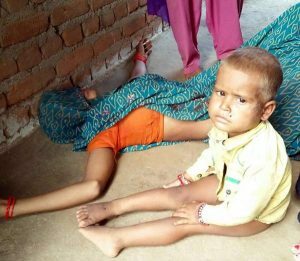 Khajuraho (Madhya Pradesh – India) When the debris of a collapsed building, a 4 years old boy came out beneath the dead body of his grandmother. In all, 7 persons were buried under the debris when a two storey house collapsed due to heavy rains of which two died. When the grandmother saw the building collapse , she hid the grandson under her. The debris fell on the lying woman while 3 years old grandson Vivek hiding under her was saved though another boy Vijay has suffered 40 stitches. Grandmother Kamla Bai (60) has set an example by saving her grandson in this way, which is being praised.